Letters for Nicola Tyson was made with inspiration from paintings and drawings by artist Nicola Tyson. Together with her exhibition in Freidrich Petzel Gallery, New York 2011, she wrote letters for dead artist about being compared to and influenced by other painters. By consciously taking inspiration from another artist I was dealing with my own fear of getting lost in someone else’s expression, but found a way to understand how inspiration from others can make you come even closer to your personal expression. This I found even more interesting when I saw the similarities between the way I was treating the paint and how I was thinking about it. I some how started to seek the connection between actions and thoughts and begun to explore different ways of using the paint. 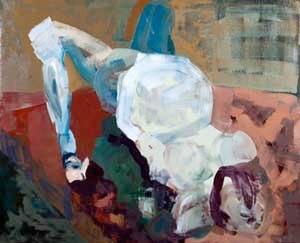 With motives of bodies standing in complicated positions I was seeking for a way to explore and to turn this relationship between action, thought, me and my surrounding into painting.